A common question I get asked as an instructor and one that has to be running through the minds of many if not most average American gun owners is: “Is Training for Me?” When I speak of “training”, I am not referring to the state-mandated class that you are required to take in order to legally carry concealed. Most gun owners will do what they have to in order to “get legal”. What I am referring to is range-based training that is designed to teach you how to employ your pistol in the context of what is most likely to happen to you if you are ever forced to defend yourself with it. An unfortunate fact that I have found is that the average American gun owner who isn’t interested in being “tactical” or learning to “operate” tends to answer that question for themselves and the answer is usually “no”. With that being the case, I want to describe the type of student that I want to have in my class; the sort of folks I got into this industry to educate. My ideal student spends his or her daily life doing what most well-adjusted Americans do. They get up every morning, maybe kiss their significant other and/or children goodbye, grab a cup of coffee, hop in the car, and go to work. They spend all day either at a desk, in a vehicle, or in the field doing what they have to do to earn a paycheck to pay the bills and put food on the table. Some of them love what they do for a living, some of them not so much; but they all do what they have to in order to be productive members of society whether that means staying at home with the kids, running the show, or working for the man. At the end of the day they come home, run through their evening routine, hit the hay, and then wake up to do it all over again. They look forward to their next weekend, holiday, or vacation to get away from the hustle and do what they love. They may have strong opinions about what is going on in the world or they may not, but they are at least aware enough of the evil that exists that they feel compelled to be prepared to deal with it should the need arise. Some of them have been around guns for their whole lives and some maybe just got introduced to the idea of guns and self-defense very recently. They may or may not be NRA members and may or may not have ever heard of Rob Pincus, Dave Grossman, or Massad Ayoob. They may spend some time on the range but they may honestly prefer to be golfing, playing with their kids or watching sports. To make a long description short: they are normal, average, everyday Americans. None of my ideal students get up every day, put on multi-cam, combat boots, a plate carrier, and an ACH and get ready for their OPORD brief before rolling out to close with and destroy the enemy. In fact, none of them probably know what in the world that sentence even means. They are not operators nor do they aspire t o be (outside of maybe XBOX live). Their water cooler conversations probably don’t contain very many acronyms or arguments about temple index vs. sul. They aren’t particularly worried about total societal meltdown or ISIS fighters coming to their hometown; but they have heard about that burglary on 8thstreet, the carjacking in their office park last week, and the suspicious people they see wandering around their apartment complexes at night. The students I am after are ordinary people who recognize that security is a personal responsibility and want to meet that responsibility by doing what they can with their limited time and resources to learn basic self-defense skills. They aren’t interested in becoming Special Forces or they probably would have joined the military instead of getting that job at the bank; or maybe they recognize that their prior military experience is a definite positive but that they need to develop skills that work in their current lifestyle. So, to answer the question of “Is Training for Me?”: the answer is YES! If you are an average working American and you seek to become an informed armed citizen with the necessary skills to defend yourself in the context of what is most likely to happen to you: I want you in my class. I don’t care if you grew up around guns or just bought your gun yesterday. I am not going embarrass you or attempt to make you into an “operator” in 1 or 2 days on the range. What I am going to do is teach you how to use your firearm intuitively and efficiently, as well as give you the tools you need to continue to develop your skills on your own. At no point will there be drill sergeants screaming at you or combat rolls. What there will be is a plethora of opportunities to learn and grow as a defensive shooter no matter what level you happen to be at when you arrive at the range on day 1. So don’t be afraid to come out and train just because you aren’t a ninja. This isn’t a class for ninjas: it’s a class for you. I’ll see you on the range! Women who carry firearms have unique challenges when it comes to finding the best ways to keep those guns on their bodies. Some women have the same options in dress as men, but many ladies—due to vocation or choice—wear dresses or skirts with no belt loops. Clothing can be thin and may not support the weight of guns and gear. Its often clingy and close fitting to show off curves. Breasts and hips get in the way or force odd angles. Finding a good holster option can be frustrating, uncomfortable, and expensive as these women move from one failure to another. That doesn’t always have to be the case, and perhaps this guide can help you ladies find concealment holsters that work for you. These are general guidelines, not hard rules. Ladies continue to impress and amaze with what they can carry and the ways they figure out how to do it safely and effectively. If you feel like you don’t know where to start or are overwhelmed, let’s explore your options. Before we can talk about what holsters to choose, it’s helpful to define what a holster is and what it’s supposed to do for the individual wearing it. A holster is a sheath that holds a gun in a consistent, accessible location. It protects the gun from wear and tear, provides comfort to the wearer, and protects the trigger area from unintentional manipulation. It also assists in concealment by breaking up the profile of the gun and keeping the gun retained during daily activity. There are products on the market that are called “holsters” but cannot provide the level of access, safety, or security a true holster can. If you can access the trigger of your firearm while it is holstered, or find it to be unstable or inaccessible while being worn, you may want to look for a different holster system. A lot of women like to start their holster search with the gun they are going to carry. It seems like an intuitive place to begin, but on the contrary, the best place to start looking for a gun and holster system is your very own closet. The type of clothing you wear on a regular basis is the single biggest factor in what you will be able to conceal and how you can conceal it. If your go-to outfit of any given day is a skirt or a dress, you have automatically narrowed the gun and holster options available to you. It’s a rare skirt that has belt loops suitable for a belt-mounted holster, but I’ve seen it done. 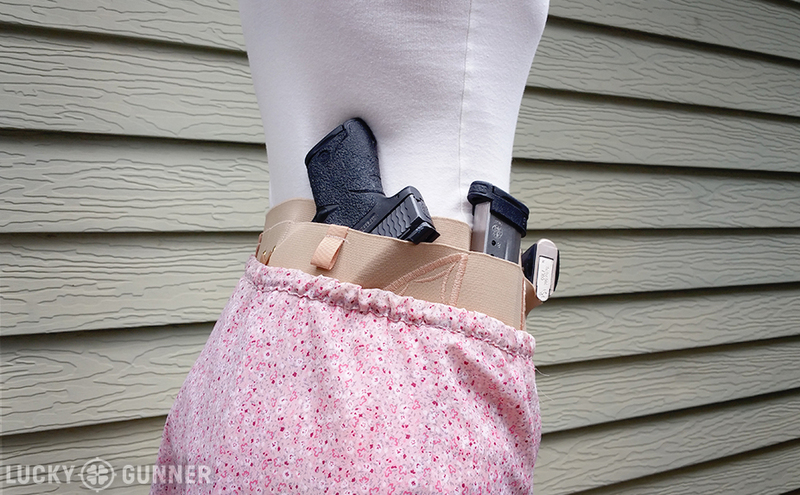 If a belt is not an option, the single best way to carry a gun in a skirt is with a belly band. Belly bands are usually made of a type of elastic material that wraps around the midsection with one or several pockets made for carrying a firearm or other gear. They are adjustable and comfortably worn in dress slacks or yoga pants that may not have belt loops or be too flimsy to hold up the weight of a gun. Thigh holsters can be an option depending on body type and the gun. Thigh holsters are worn like ankle holsters, on the inside of the thigh opposite the dominant hand. This means that a right-handed woman would draw the firearm from the inside of her left thigh. As you can imagine, women with generous thighs might find a firearm between them to be chaffing, and depending on the weight of the gun and the amount of walking done, thigh holsters might slip throughout the day if a garter belt is not used. For an evening sitting at a banquet or a formal event, however, they can be a comfortable option. Ankle holsters work well for long dresses and skirts or pants with boot cuts. While less accessible—particularly on the run—it provides on-body security or a good back up option. Other specialty holsters like compression shorts, holster tank-tops, or other wearable options are also available in addition to off-body carry in purses and bags. These options can be comfortable, though they are less accessible due to the multiple layers of fabric needed for concealment or compartments that need opening. Not many women go out and about without a bra on, which makes bra carry a clever option unique to the ladies. Whether between the cups or tucked up under an arm, bra holsters are accessed from under a shirt or through a plunging neck line. Women with larger breasts can conceal a bigger firearm in a bra holster, but they must then handle the extra weight of it on their bra. It’s important to take into account the weight of the gun you’re trying to conceal and how it works with the holster system you are considering. If you’re lucky enough to lounge around in jeans and t-shirts most of the time, then allow me to congratulate you on finding an easier way to carry a gun. Simply put, nothing beats a good belt-mounted holster on your waistband for stability, access, and retention. While concealment can be tricky with holsters meant to be worn outside of the waistband (OWB), it may be possible with the use of long, flowing shirts, sweaters or vests. OWB holsters—at least the good ones—also require the use of a belt. One of the most overlooked keys to comfort and concealment for women is a good belt. Most women do not wear them, and saying, “gun belt” in a group of gals brings up images of police officers with more gear than Inspector Gadget, or something black, ugly, and manly. As more women seek out carry options, the market for female accessories has expanded to belts as well. More fashionable belts that contour to the curves of a lady’s body make carrying a firearm a far more secure, comfortable, and clandestine experience than many women think possible. If a belt absolutely cannot or won’t be worn, depending on the stiffness of the waistband, some inside the waistband holsters have been designed specifically to be worn with or without a belt. Some women have been willing to change their mode of dress to accommodate a firearm, and that’s something to consider if you are serious about concealed carry and having a hard time finding what works for you. No one wears coats or jackets all day unless they are planning to be out in cold weather so it’s not an ideal solution for concealing a gun on a regular basis but, for women, coats or jackets may be the only article of clothing with large enough pockets to accommodate a pocket-carried firearm. Pocket holsters break up the profile of a firearm nicely, and make the firearm far more accessible than standard carried firearms when cold weather attire is needed. The holster should be secure in an empty pocket as to not draw with the gun and care must be taken to not leave the coat or jacket unattended with a firearm in it. For a walk on a cold day or a quick run to the store where you’re not going to remove your coat, a pocket carried firearm may be an option. Now that you’ve looked at your wardrobe and assessed what you wear most often, it’s time to look in the mirror. Different body types impact how a holster may work with your body for comfort and concealment. Apple-shaped bodies have more width at the top that may make carrying under the arms uncomfortable and hard to conceal. If they carry around the waist, the v-shape of their body might press the grip of the firearm out and make it hard to conceal. A good belt or holsters specifically designed to tuck the grip back into the waistband may be a good option. Pear and hour-glass figures might have better success carrying around the waistband as the curve of the hip pushes the grip into the torso for better concealment in a behind the hip carry. They might have to play with the rise of their waistbands, however, to keep the grip from poking their ribs. High rise pants can make the gun poke. Low rise pants may make the grip start to fall away from the body and compromise concealment. Mid-rise pants that place the muzzle-end of the firearm and holster on the broadest part of the hip seem to work well. Hourglass figures might also have an issue carrying firearms under arms without looking lopsided. Round bodies could find it difficult to conceal around the waist without a belt or purpose-built holster that will tuck the grip into the stomach or side. They do, however, have more curves to hide firearms. A bra holster could either be very comfortable or very uncomfortable, depending on the roundness of the belly. Under arm options might also work well. Rectangular bodies may not have the issues with curves but may still battle concealment issues due to clothing choices. No matter the body type, each wearer should be careful to evaluate their chosen method of carry for safety and comfort. Firearms and accessories should never be placed over the spine due to the potential for spinal injury in the event of a fall or fight. At no time should you be forced to point a firearm at your own body during the draw stroke. Some holster systems are not meant to accept a firearm while it’s being worn. Soft-sided holsters and many bra holsters should be removed from the body, the gun placed in the holster, and the holster then put back in place. Now that you have a general idea of what holster methods and carry locations may work best with your body and clothing choices, it is time to look at your pistol and whether or not it will suit your needs. The general advice is often to carry the largest gun you can conceal and shoot well. That’s good advice and applies here. Remember that heavier, larger guns need more support than smaller, lighter ones. Soft-sided or unsupported holster systems may not retain some firearms well, or they may require constant repositioning or adjusting throughout the day. To solve that problem, you can either downsize your firearm or purchase a more supportive holster with multiple mounting points and a good gun belt. If a subcompact is uncomfortable to shoot, you can learn and practice on larger firearms and sneak in shorter shooting sessions through their carry guns to check for function and familiarity. Concealed carry for women may seem challenging but on-body concealment with the right holster with respect to the wardrobe and body type can make daily carry a comfortable reality. Special thanks to Tammy Smith of Gun Start for her contribution on carry positions for different body types.